Background: Gefitinib (GEF), the kinase inhibitor, is presently available as tablets to be taken orally in high doses of 250-500 mg per day due to its poor solubility. The solubility issues affect not only its onset of action but also the bioavailability. These drawbacks foresight the need to have an alternate dosage form, preferably a sustained release formulation. Methods: In the present study, microparticles were prepared by emulsion solvent evaporation using PLGA 50:50 (GEF-PLGA MP). A 32 factorial design was used to optimize the critical quality parameters to the set mean particle size in the range of 7.4±2.5 µm and entrapment efficiency of 80%. SEM microscopy of the prepared microparticles confirmed to have a spherical smooth shape. The GEFPLGA- MPs sustained the release of GEF for 72 hours. The first-order kinetics ruled the mechanism of drug release and was predicted to follow Fickian diffusion. Result: Anticancer efficacy was judged by the cytotoxicity studies using the L132 lung cancer cells. MTT assay showed 3-fold enhanced cytotoxicity of GEF loaded microparticles against L132 cells as compared to plain GEF. 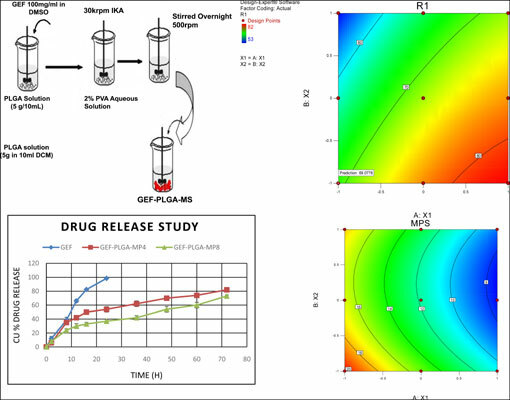 Conclusion: It was concluded that gefitinib can be efficiently loaded into the biodegradable polymer PLGA to provide sustained release of the drug. Microparticles, gefitinib, sustained release, factorial design, cytotoxicity, PLGA.